As the last official sub scenario in the game beyond facing enemies you've already met before, Yulyana's sub scenario takes a long, long time to pop open. To activate it you need to make your way to Chapter 6 in the story. You must also activate three of the four crystals and speak to Yulyana, both at the Needleworks and in the Vestment Cave. Do all that and you'll open up the sub scenario. - You may not notice this sub scenario if you haven't been keeping up with all the others that appear in Chapter Six, but it appears at the Yulyana Woods Needleworks. Head there now and check the house. - Yulyana is not home. Nevertheless, he has left a note behind for you to check. It advises you to head to the chambes of the Council of Six - namely, the top room in Eternian Central Command. - Make the trek out there, and find your way up to Command. 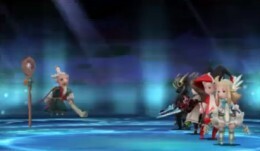 Don't neglect to stop off in Edea's room on the way up if you start to run out of steam from all the battles. Cut scene. You thought you'd get to battle? Not immediately. - Head back down to Edea's room. Poor Alternis. Yep, gotta battle the sucker. - Cut scene after it's done. Leave Eternian Central Command and head for Eternia. - Enter the healing building in the north. Braev's here, in the room up top. Visit him to see a cut scene... and a battle. Oi. You've fought him before, you'll fight him again. Meh? Dark attacks work great. Wait for his defense to go down and pound him with Dark Knight skills. Rage will absolutely maul Braev on a strong Dark Knight. - Cut scene. New destination: the lovely Florem. - Head to the matriarch's house in the north. Cut scene. Off to the Twilight Ruins! - Make your way to the end of the Twilight Ruins. Save, then go up the stairs. Cut scene. Of course you have to fight! All three sisters at once? Oh my, now that's a humdinger of a battle. This fight isn't as tough as it seems, but it's tough enough. All three of your opponents have all-hitting attacks, and Mephilia and Artemia like to spam theirs a lot. Multishot isn't so bad, but Girtablulu... suffice to say that it hurts. A lot. Einheria backs the other two up with her powerful Valkyrie attacks, but because she burns up BP quickly she's also easy to anticipate and guard against. One character has to be on healing duty throughout this battle while the other three swap between Default on one turn and blasting away at the next, taking their moves when Einheria is paused. Wipe out Mehphilia first, as she's the most dangerous and is seemingly the most fragile, then go after Artemia and Einheria in that order. All three can be brutal; two is better, but still tough; one isn't bad at all. - One more destination to go. Head back to Caldisla and visit Norende Ravine. Make your way to the end to watch a cut scene. There's a reeeeeally easy battle to face, for some reason, and you'll zip back to Grandship. - Head to Yulyana Woods Needleworks after you're done flitting about the world. FINALLY! Yiiiiiikes. Yulyana isn't quite as strong as DeRosso, but he lives up to his reputation as a legendary warrior. Yulyana sticks to three attacks: Amped Strike, which deals a ton of physical damage to one person; Meteor, which hits everyone with poor accuracy but killing damage; and Deux Ex, which boosts Yulyana's magic attack by one and a half times. He'll also hit you normally, and you should pray for those moments. Nevertheless, this battle isn't so bad. Yulyana is typically capable of killing a character a round, but that's the extent of his offence. You're only likely to lose two people to Meteor if you get unlucky. Hold back on your BP and dole it out sparingly, healing as you go along to keep your party at full strength. Strong, low BP attacks are preferable. Rampart is also quite useful for blocking Amped Strike, though not essential. It'll be a long battle, but you'll manage in the end.